A contemporary take on gorgeous things to make. Making it yourself rather than buying it off the shelf has never been trendier. Whether driven by eco considerations and anti-consumerism or by the desire to own or give something personal rather than uniform, many more of us are getting out the knitting needles and sewing kit, and taking pleasure in lavishing some TLC on our homes, our friends, our children and ourselves. 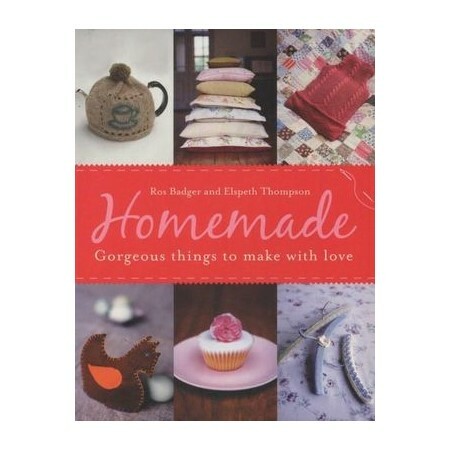 Homemade is packed full of ideas for things to make that make life that little bit better. From crocheted coat-hangers to cordials and cupcakes, from cushion covers made from vintage blankets, old shirts cut up to make summer bunting or beautifully simple decorating ideas for an old-fashioned Christmas tree, here are over a hundred ways of adding individuality to your home and to the things you give. You'll save some money along the way - and using materials you have to hand not only saves the cash, it also means building a little bit of your history, whether from a favourite worn-out skirt or pebbles you've collected on holiday, into the things that surround you. While the book is practical and project-based, covering everything from knitting gloves to making natural moth repellents and devising the most gorgeous hand-made gift wrapping, it is also aspirational and chic - a key requirement is that the finished result has to look better and more desirable than a shop-bought version. Many of the ideas are incredibly simple and can be done in minutes; some are more of a labour of love; all have clear instructions and gorgeous accompanying photographs that cannot fail to inspire you to get going and add some homemade glamour to your home and your life.